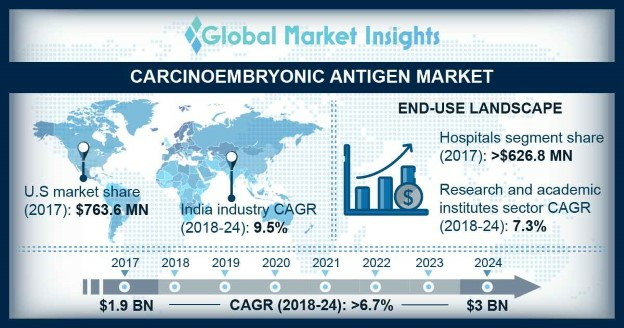 Carcinoembryonic Antigen Market size is set to reach USD 3.0 billion by 2024; according to a new research study published by Global Market Insights, Inc. Rising geriatric population base coupled with growing number of cancer diseases is driving the carcinoembryonic antigen market size over the forecast timeframe. According to the World Health Organization, cancer is the second leading cause of death globally, with an estimated 9.6 million deaths in 2018. Additionally, worldwide, about 1 in 6 deaths is due to cancer. All these factors will propel the global market growth. Constant advancement in technology such as proteomics that includes mass spectrometry, protein bioinformatics, protein labelling, imaging and array-based approaches with the development of new biomarkers that can be used in combination with other biomarkers is anticipated to fuel the demand for carcinoembryonic antigen market growth during the forecast timeframe. Favorable government initiatives for the improvement of diagnostic rates and the advancement of new combination biomarkers has immense growth opportunities for carcinoembryonic antigen market. Hence, it will result in increasing demand for effective carcinoembryonic antigen tests, thereby fueling business growth. The inability of carcinoembryonic antigen tests to detect early stage cancer will be a major market impeding factor. In addition, lack of awareness regarding the application of carcinoembryonic antigen tests will decrease the demand, thus hindering the market growth. Gastrointestinal cancer market was valued around USD 652.4 million in the year 2017. According to an article published in the National Center for Biotechnology Information, gastrointestinal cancer is the fourth most common malignancy worldwide and remains the second most common cause of death of all malignancies globally, hence driving the market growth for carcinoembryonic antigen. Breast cancer market is estimated to grow at a CAGR of 7.3% over the projection period. Breast cancer is the most common cancer affecting the women population. Furthermore, breast cancer diagnosis involves three tumor markers, one of them being carcinoembryonic antigen; carcinoembryonic antigen tests have been used to help monitor metastatic breast cancer (advanced disease), that will propel the industry growth in the forthcoming years. Males in carcinoembryonic antigen market was valued around USD 1,003.2 million in the year 2017. The rationale for greater market share in men carcinoembryonic antigen market is the greater frequency of cancer diagnosis, rather than poorer survival once the cancer is diagnosed at a late stage. Furthermore, lifestyle-related factors such as smoking, drinking increasing amounts of alcohol, putting on weight, and taking less exercise are also responsible for the largest share of males in carcinoembryonic antigen market. The hospitals market is projected to grow at a considerable CAGR of 6.1% over the forecast timeframe owing to increasing number of hospital admissions. Geriatric population suffering from cancers requiring continuous monitoring prefer minimally invasive procedures carried out in hospitals and clinics, that will boost the market growth. U.S. market is estimated to grow at robust CAGR of 6.0% during the projection period. Increase in number of geriatric population affected with cancer, advancements in carcinoembryonic antigen tests, greater patient and physician awareness regarding early disease detection and availability of low-cost tests across broader settings of care are some of the major factors contributing to largest market share in the region. Japan dominated the Asian market and was valued around USD 74.6 million in the year 2017. Growing awareness about pre-disease diagnosis and prevention will further drive the market growth. Additionally, rising per capita healthcare expenditure and growing demand for rapid and cost effective carcinoembryonic antigen tests will fuel the market growth in Japan. Some of the leading players in the carcinoembryonic antigen market include F. Hoffmann-La Roche Ltd., Quest Diagnostics, GenWay Biotech Inc., Correlogic Systems, Inc., Creative Diagnostics, Omega Diagnostics Group PLC, RayBiotech, Inc., and Boster Biological Technology. These companies opt for strategic decisions such as mergers, acquisitions, and partnerships in order to increase their efficiency and sustain in the market.